It seems like it was just yesterday that Justin went to his first semi-formal dance. It was a really, really big deal. Because well, you know, GIRLS. And we all know that ‘every girl’s crazy ’bout a sharp dressed man’. I helped him pick the right shirt (he wanted purple!) and a matching tie for the occasion; Mark taught him how to tie the tie. This is a skill he’ll need for the rest of his life. That was seven years ago. Since then there have been many dances and a couple of proms. And I suspect that the next ten years will see weddings and other fun events that will require knowing what to wear. Spend money on a good belt. A good belt can even dress up a pair of jeans or khakis. Make sure your shoes are clean. For that matter, always have at least one pair of dress shoes. Get two nice dress shirts – one in a solid color and another in a print like a small check or subtle plaid. Get a tie that matches the above-mentioned shirts. Finally, IRON your shirts and tuck them in. For the most part, you can’t go wrong if you stick to these general guidelines. BUT there are times when knowing what to wear can get a little tricky. We recently ran into this during the holidays. We were invited to a holiday cocktail party. I knew what to wear but we had to double check cocktail wear for men to be sure that the guys were appropriately attired. Let’s be real here. Most of the guys in our life don’t like to shop. It’s usually us – the mom, girlfriend or wife that’s making sure our guy is looking sharp. Thank goodness The Black Tux makes renting a suit or tuxedo easy. Check out their website for prom and formal wear inspiration. There are lots of options along with advice for getting the perfect fit. Thank goodness for this handy cheat sheet. Be sure to bookmark this page or Pin this style guide for quick reference. So true. How about an article for the ladies on how to properly help them dress? I do need help tying a tie. Lol. Great idea. 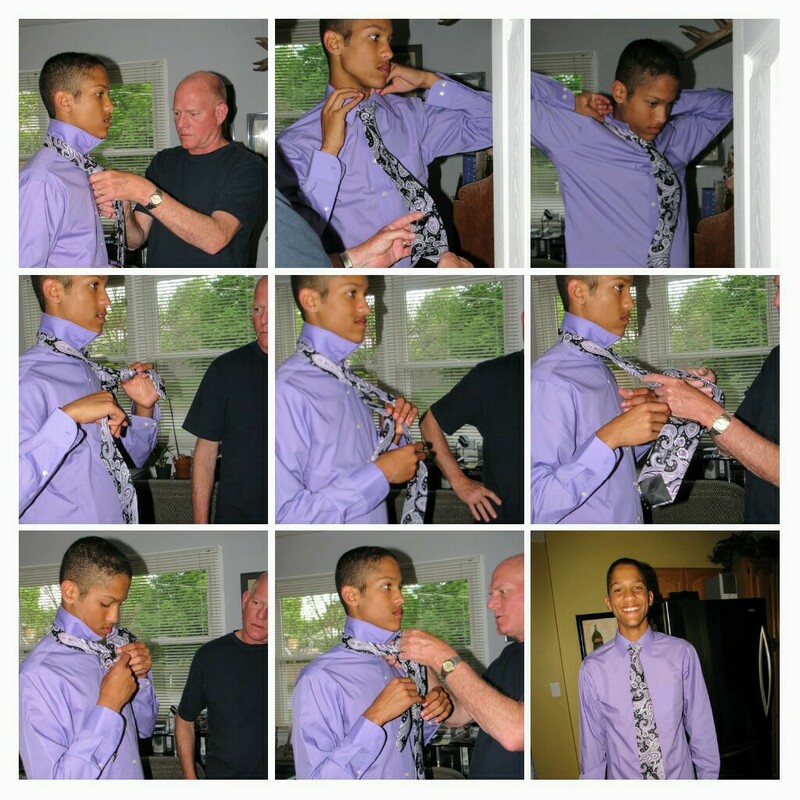 How to tie a tie 101 . . .